Number two of this series of sweet toothed vegan cookbooks and much improved on the first. 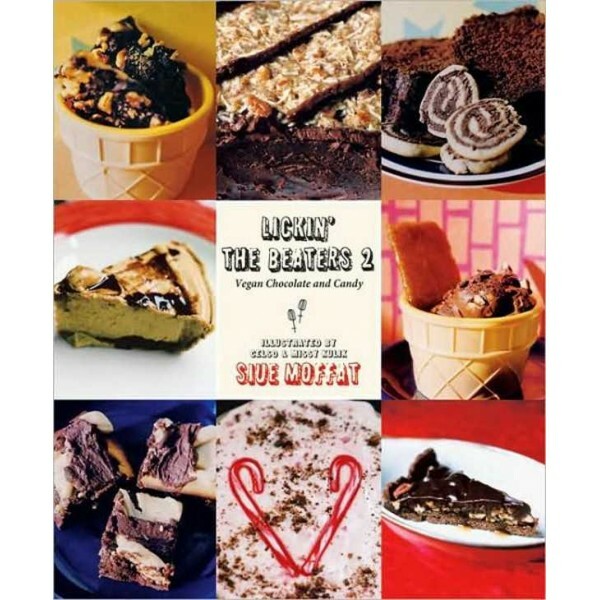 The beaters go on--in Lickin' the Beaters 2: Vegan Chocolate and Candy, the second of Siue Moffat’s fun vegan dessert cookbooks. Themed around the duality of dessert--an angel on one shoulder and a devil on the other--Siue takes chocolate, candy and even ice creem (vegan alternative to ice cream) head-on with quirky illustrations, useful hints and a handy “Quick Recipe” indicator to make using this book simple and amusing. With an understanding that dessert should be an indulgence, Moffat provides vegan renditions of tantalizing delicacies both traditional and original. Recipes include old favorites such as Carmel Corn, Salt Water Taffy, Pralines, Cookies, Cakes and Fudge as well as some brave new recipes like Fabulous Flourless Chocolate Torte and Toll-Free Chocolate Chip cookies. Siue Moffat is the author of Lickin’ the Beaters: Low Fat Vegan Desserts. She lives in Toronto. Celso is the comic book artist and writer of Monk in Ogreland and has contributed to such zines as Clip-Tart,Free, and Hame-Kame-Ha! He lives in Portland, Oregon. Missy Kulik is a product and graphic designer who also draws comics for the free weekly paper Flagpole Magazine. She lives in Athens, Georgia.